La Jolla community members disagree on the location of a crossbridge, but stops at UCSD will not be affected. The placement of a bridge over Interstate 5 has set residents against a La Jolla area Mormon church in a debate over the future of the Mid-Coast Transit Project — which is slated to connect Downtown San Diego to the La Jolla community and the UCSD campus via extensions to the Blue Line Trolley by 2018. Progress has stalled as disagreement between Cape La Jolla Garden residents and members of the La Jolla Temple of the Church of Jesus Christ of Latter-Day Saints has arisen over which streets adjacent to I-5 will connect to a bridge planned as part of the project. The debate over whether the bridge will be constructed farther north or south, however, will not affect where future trolley stations will be located on UCSD. According to the San Diego Association of Government, a trolley bridge across the I-5 is necessary for the Mid-Coast Transit Project, anticipated to begin construction in 2015, to create stations at La Jolla Village Square, around the UCSD campus and the Westfield University Town Center mall. An April 17 NBC 7 San Diego article stated that the Cape La Jolla Garden residents and leaders of the La Jolla Temple both believe they will be most affected by the construction process. SANDAG Director of Mobility Jim Linthicum oversees the Mid-Coast Transit Project — which first came to fruition in 2013 — and hopes to get as much input from community members as possible before making the final decision. A presentation of the project will be held on May 9, and will be open to the public for feedback. SANDAG expects to make the final decision on the placement of the bridge this summer. The County of San Diego will approve the final location in a majority vote at a later date, according to NBC 7 San Diego. UCSD Vice Chancellor for Resource Management and Planning Gary Matthews supervises three to four major transportation Light Rail Projects, which are part of the Mid-Coast Transit Project. “I don’t think it will impact [UCSD] at all [and] we are not affected by that discussion,” Matthews said. There will be two stations on the school campus. One will be close to Pepper Canyon in Sixth College and another stop will be in the east campus near Preuss school on the opposite side of the I-5. According to Matthews, there will be another stop near the Veterans Hospital, which is not near campus, but aims to draw people to the university for cultural events. Meanwhile, other light rail projects will also be implemented on campus, such as the Gilman bridge and the I-5 direct access ramp Voigt Bridge connecting to UCSD. These projects are funded by Federal Transportation funds and Local Trans Net tax funds. The Gilman bridge is a part of the Light Rail Trolley Project and will be placed near the Veterans Administration Medical Center connecting to Sixth College. It will facilitate both pedestrian and vehicle crossing to UCSD. Additionally, a direct access ramp will connect the I-5 freeway exit directly to UCSD. 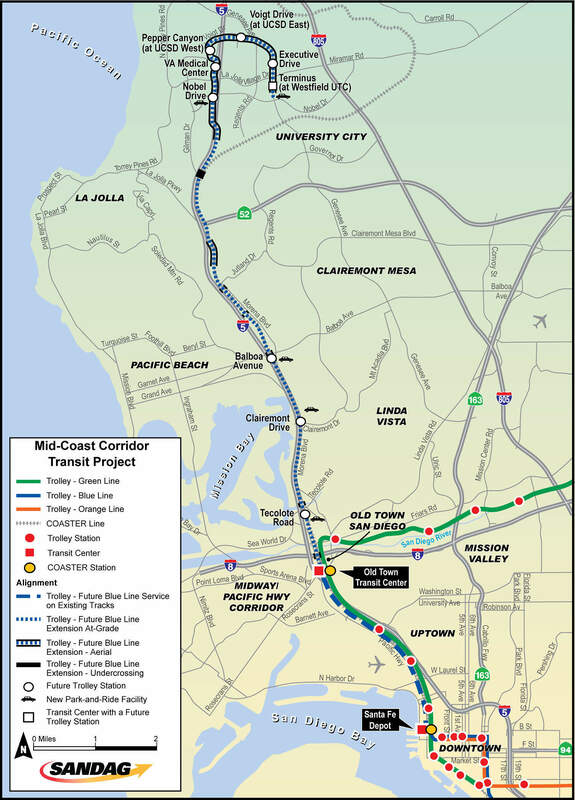 There will be a briefing in July to the UCSD Regents on the Mid-Coast Transit Projects including the Gilman bridge, direct access ramp and other light rail projects. Construction on all projects is expected to begin in the next few years.